Paris, the metropolis on the Seine, is one of the most popular tourist destinations in Europe. The Louvre, the Eiffel Tower, the Arc of Triumph and the Obelisk of Luxor are just a few of the top attractions that almost every holidaymaker visits. But Paris has much more to offer than just the 'hotspots.' Anyone who wants to get as much as possible out of their stay in the city of love should definitely opt for hiring a rental car. On Driveboo, you can compare car rental deals in and around Paris, select the car that best suits your needs, book it conveniently online and save lots of time. Where can I rent a car for my Paris trip? At the airport, you will benefit from multilingual staff, which is especially useful if you do not speak French yourself. Choose a comfortable compact car, a well-stocked mid-size car, a luxury car or even a family van and embark on an exciting tour around the city of love. But beware! If you have not yet booked your flight, it is worth comparing the car rental offers at each of the above-mentioned airports, as the car rental companies at the airports tend to have different prices. Do I need an international driver's license to drive in Paris? No - if you have a driver's license from an EU member state, you do not need an international driver's license. 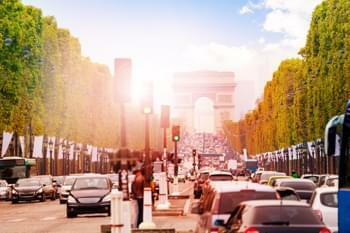 What are the traffic regulations in Paris? Most French motorways are subject to a toll, so it is advisable to plan your trip in advance if you want to go outside of Paris with your rental car. In most cases, the toll is either payable when driving onto the highway or a ticket must be drawn to pay the fee when leaving. 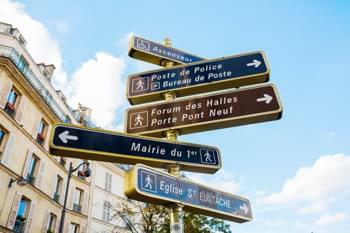 What road signs should I know before driving a rental car in Paris? Where can I park my rental car in Paris? Travelling with a rental car in Paris is not rocket science. A wide range of car parks, where you can park your rental car from just one euro per hour, makes it easy for you to get to most of the beautiful sights in the city. However, if you are in the suburbs and cannot find a parking garage, then it is advisable to pay attention to the lane markings, which tell you whether or not you can park your car there. A general stopping ban applies under bridges and in tunnels or underpasses. A single day in Paris is nowhere near enough time to see all the most beautiful parts of the city—even a single visit to the Eiffel Tower or the Louvre takes hours. In addition, there is so much to discover in various parts of the city and the surrounding area that, ideally, you should spend several days in and around Paris. The best way to explore all the sights of the city on your own is to hire a rental car in order to not to have to adapt to the pace of guided tours and to plan your trip the way you want it. 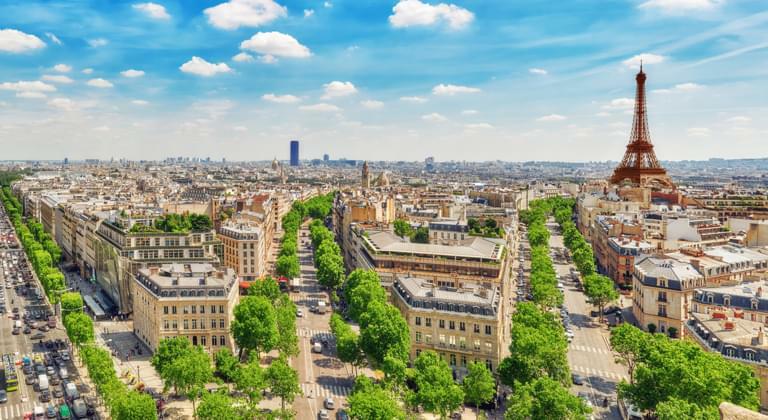 Anyone who has ever been to Paris and already knows the top attractions of the city may be interested in getting to know the lesser known, but equally interesting, places around the city. Take in the small Eugene Delacroix Museum, housed in an apartment where the artist was artistically active until his death, visit one of the largest European contemporary art exhibitions in the Palais de Tokyo or go to the market hall known as Le Carreau du Temple and follow in the footsteps of the Knights Templar. So, you already know the Parisian Catacombs and have done a night boat trip on the Seine? Then you should take your rental car for a trip outside of the city. A must-visit place is, of course, the Palace of Versailles and—if you are not afraid of a long drive—even a day trip to Mont Saint-Michel, the UNESCO World Heritage Site in the Wadden Sea of Normandy. Those who plan to holiday in Paris with children can also take a trip to Disneyland, where the whole family will get money's worth.